10 Months (and one week) Old! 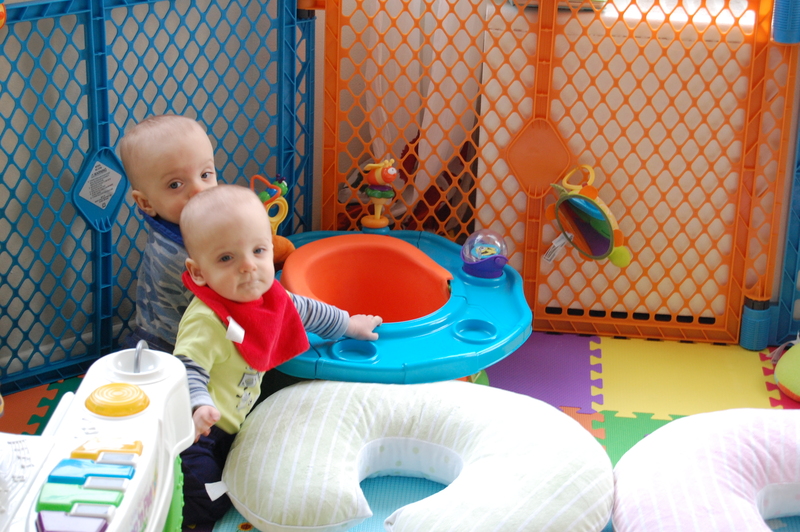 It seems like these babies are learning new tricks every day. 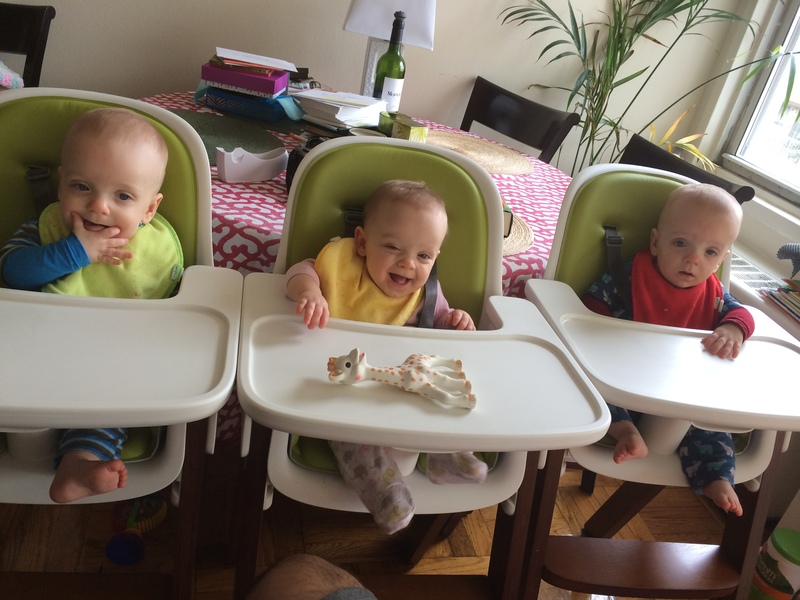 The latest developments are: sitting up unsupported, pulling up on things, and teeth! Read on to see who’s doing what. Still our teeniest peanut, Sophie is always the last to sleep and the first to wake, but the lack of daytime sleep doesn’t seem to bother her much! 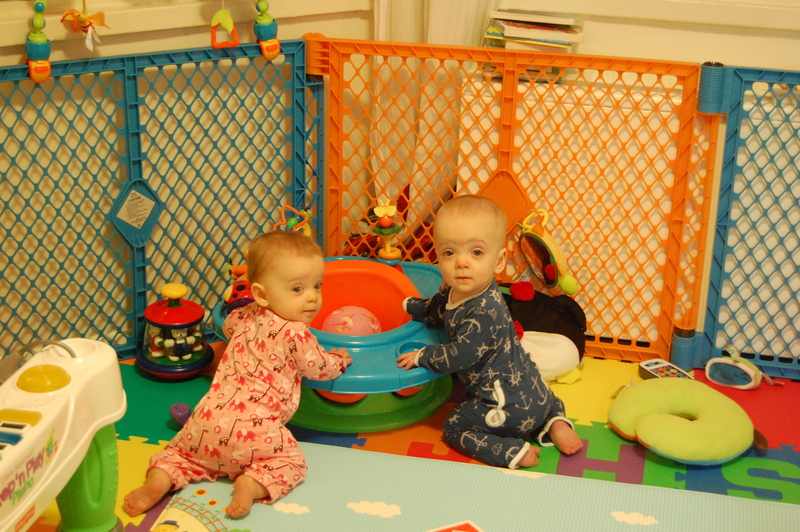 She loves playing independently, in her crib, on her play mat, or rolling around on the floor of her room. 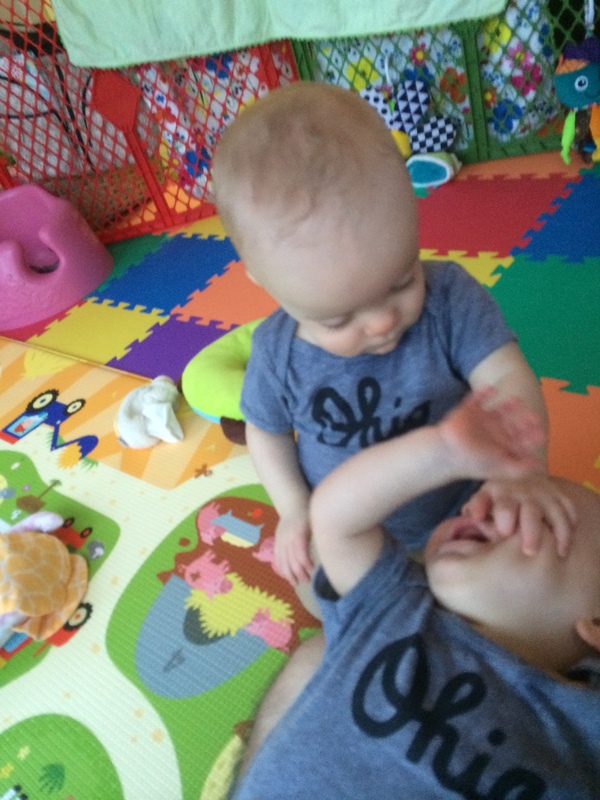 She also thinks it’s hilarious when one of her brothers pins her down. She’s still rocking the army crawl, and she’s getting faster by the day, so she can escape the clutches of Henry and Jack when necessary! Hey! Who’s that silly girl in the mirror? Henry is fearless. 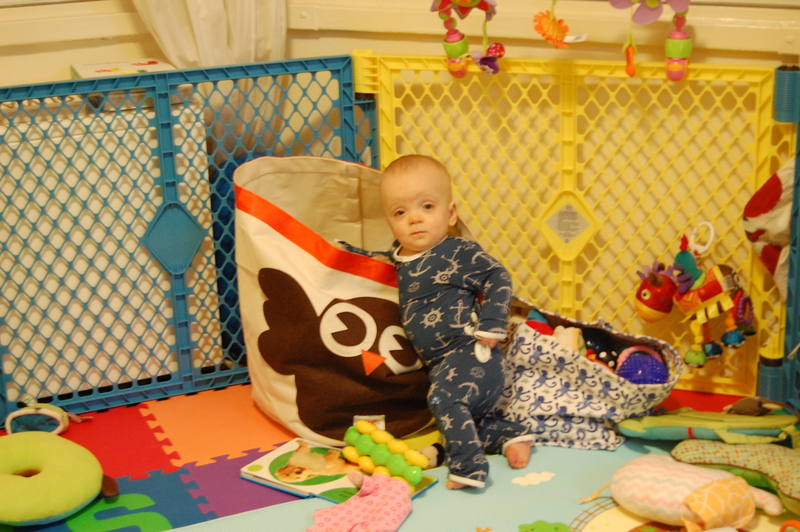 He hates sitting up, but he loves trying to stand. 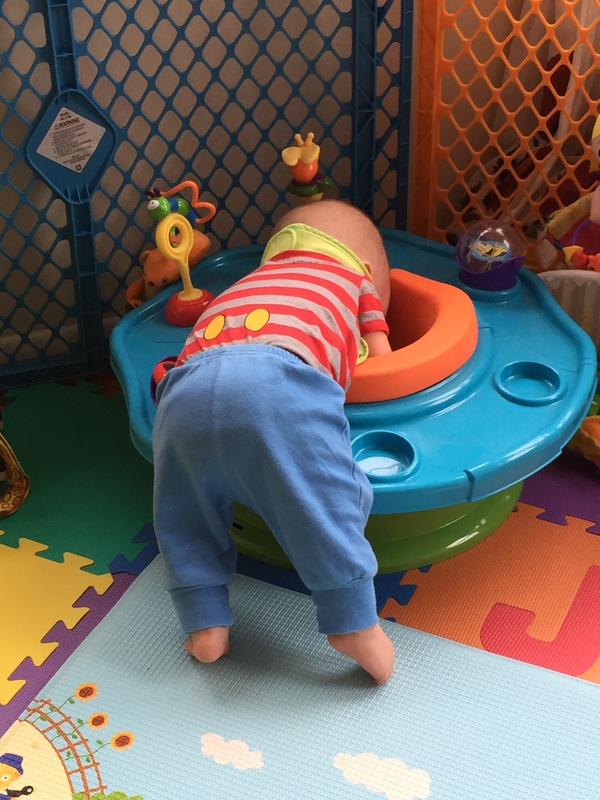 He’ll climb over anything and anyone to get to where he wants, which is usually just the other side of whatever or whoever it is so that he can climb back over again. He squeals when he’s happy and is quick to let you know when he’s not. He’s got two bottom teeth, and if you’re lucky, he’ll smile wide enough so you can see them. Hint: he’s very ticklish! 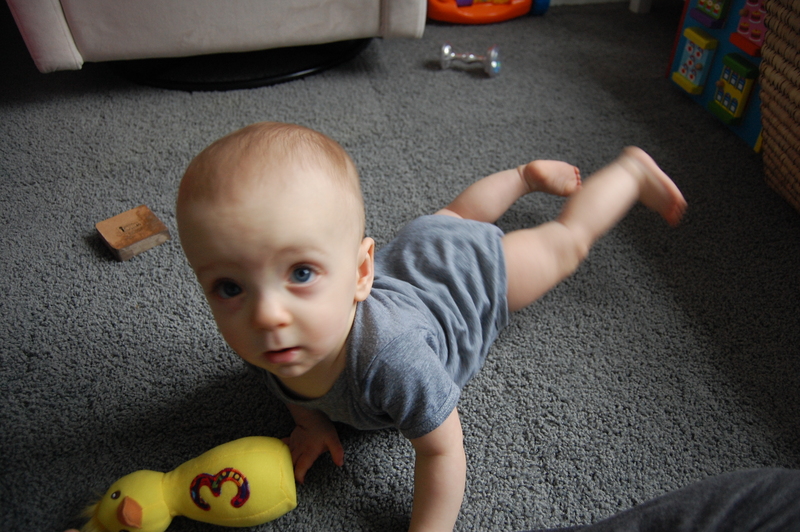 Jack is our expert crawler. He’s a pretty good sitter too, though he hasn’t quite figured out how to get out of the sitting position once he’s in it! He’s an avid climber too, and the first to use the baby gate to pull himself up (as he wailed for freedom on the other side). He likes splashing around in the bath tub (literally) and playing Peek-a-Boo in his high chair or crib. 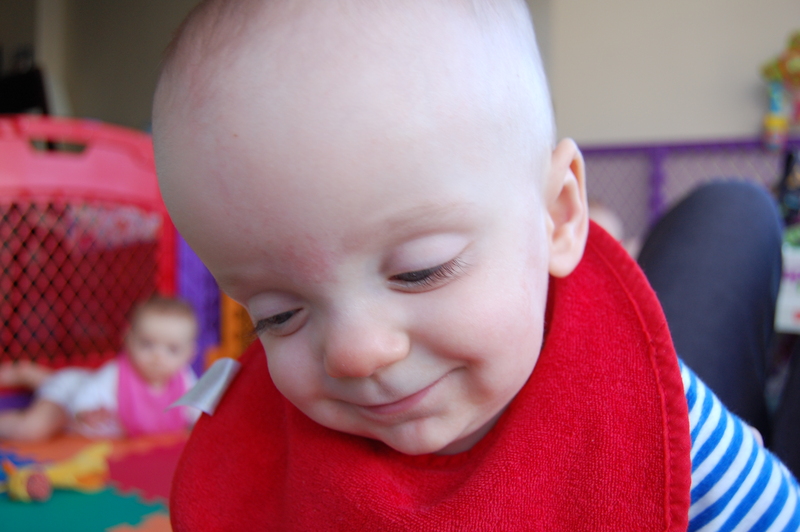 He loves to feed himself puffs and banana pieces, but he’s not a big fan of beef, or lentils, or pasta. 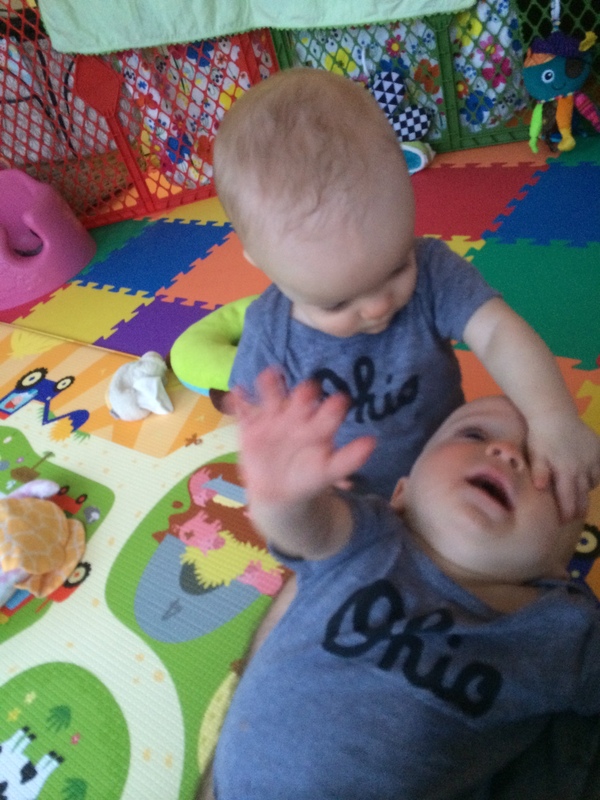 He also likes wrestling with his brother and tackling his sister Sophie. 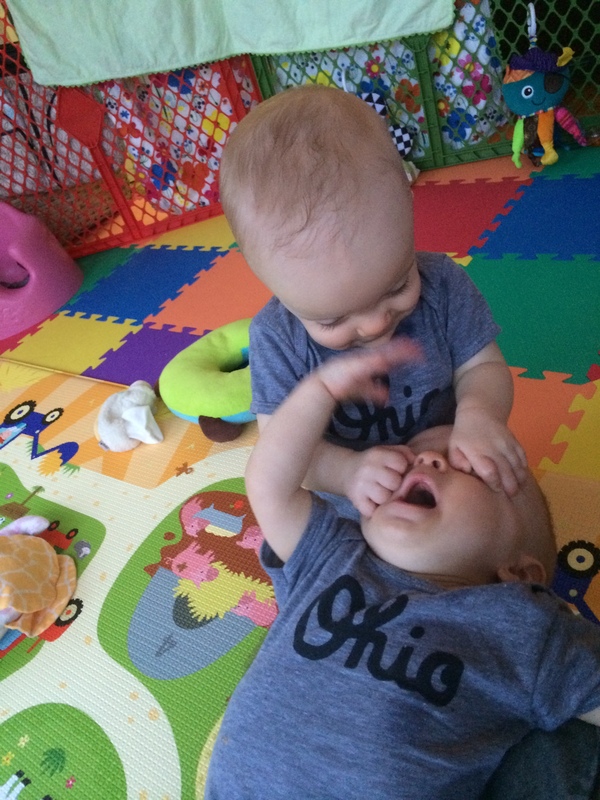 He has two teeth to match his brother’s. New tricks: pulling up to his knees, crawling around on all fours, babbling up a storm, pushing up to stand, baring his two teeth! We hold most of our meetings under the exersaucer. 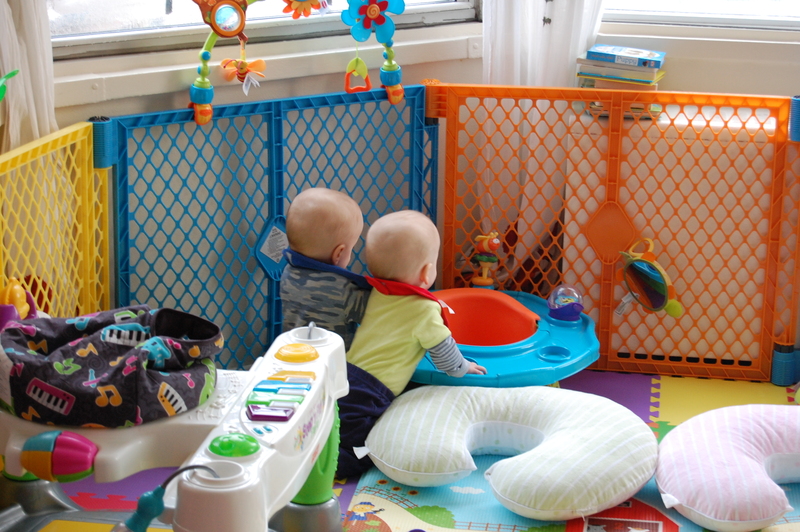 This was a SECRET meeting under the exersaucer. 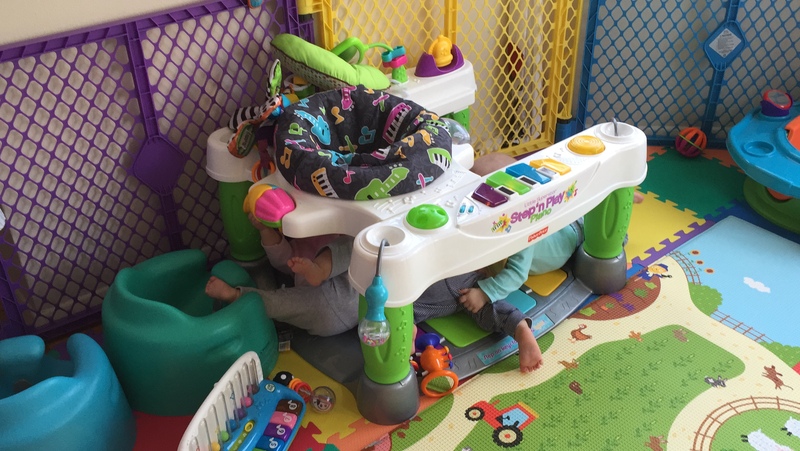 How many feet do you count under there? Don’t worry, Sophie’s having fun! 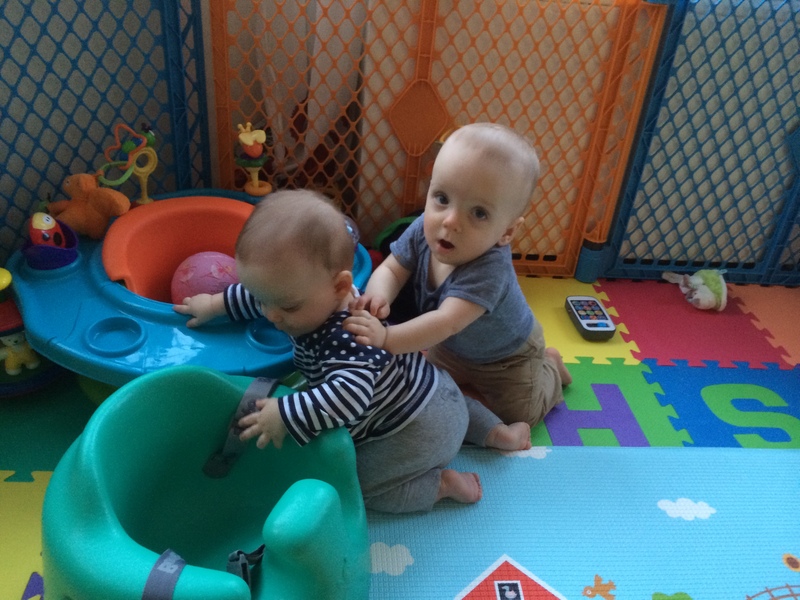 Mom makes a pretty good jungle gym… Brotherly Love?